I have over 300 colors of thread, including thread to match all of my ribbon and feather options. Please be descriptive in your color specifications for your names or monograms. For example, instead of requesting "blue" in the thread color box, please specify light blue, royal blue, navy blue, etc. 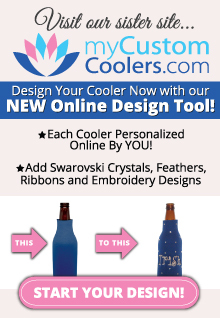 If you are ordering coolers with ribbon, you can either specify the thread color or you can simply type "match ribbon" in the thread color box and I'll make sure to select a color that will best match your ribbon choice. For example, if you like the flip flop 3 design but want it in different colors, you can certainly have it that way. Just be sure to either note your desired color scheme for the flip flop 3 design in the order notes or request something like "match flip flop 3 design to cooler and ribbon choice". If you have any questions at all, please feel free to email me.